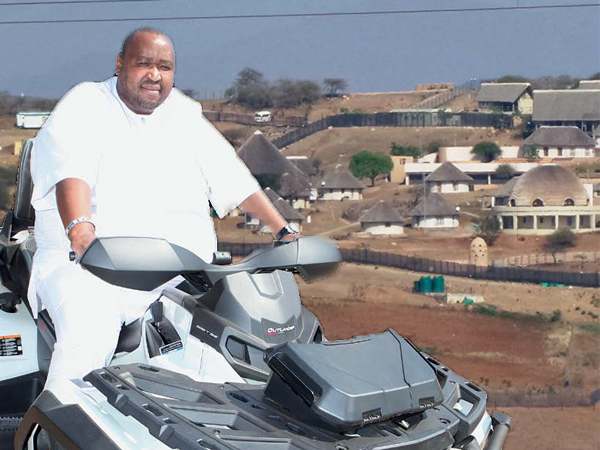 Somehow, YOU’s Dana Snyman found himself a guest in the Nkandla home of the president’s nephew Khulubuse Zuma. And it got a little weird. "It feels a bit unreal to be here where President Zuma has built himself virtually a small village," Dana Snyman wrote of his visit in 2014. The policeman at the boom shakes his head. Yes, he says, there’s a visitors’ centre inside but at the moment no one’s allowed to visit. Sorry. Two cameras watch us from a pole. 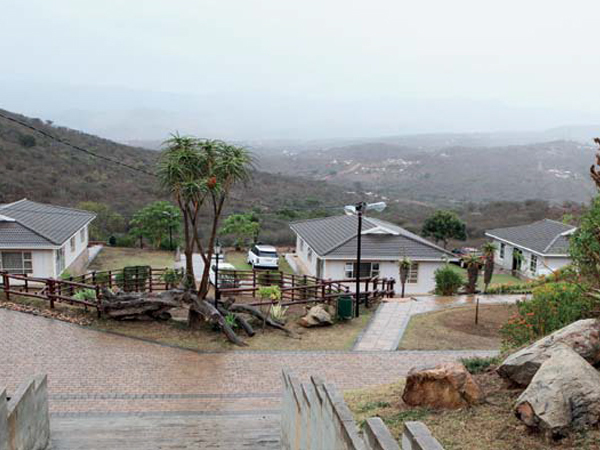 The buildings, paved roads and open spaces here at the entrance to President Jacob Zuma’s residence in Nkandla, near Eshowe deep in KwaZulu-Natal, are new and modern. To the right of the boom is an office from which the policeman has just come, a long building with dark-tinted windows and the kind of X-ray machine you find at airports. To the left is another long building. The door is open. Against one wall are shelves packed with goods – tins of bully beef, beans, biscuits, soap and jars of Vaseline. This must be the famous tuck shop of the president’s first wife, Gertrude Khumalo. There’s been a lot written about it in the newspapers. 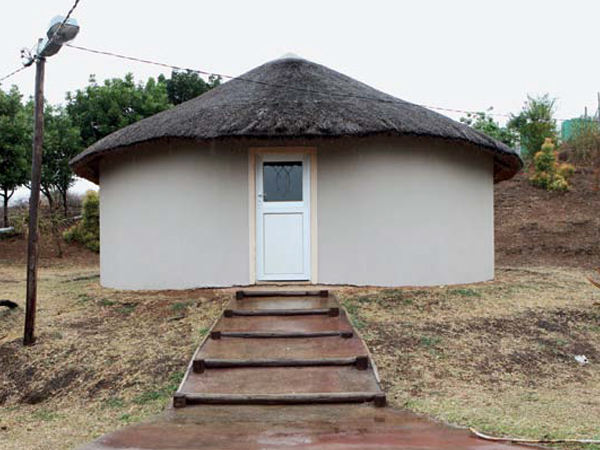 It was built for a few hundred thousand rand because it was apparently a security risk for MaKhumalo to have it outside the presidential complex. The policeman gives a weak smile. If we want to we can buy ourselves a cooldrink in MaKhumalo’s shop. And he’ll have one too. We get out of our car. A rooster crows constantly nearby. It feels a bit unreal to be here where President Zuma has built himself virtually a small village, surrounded by a double security fence, with separate houses for each of his four wives, an underground parking area, an amphitheatre and visitors’ centre, two helicopter landing pads, an escape tunnel, a cattle enclosure and a swimming pool. Then, suddenly, things start getting weirder because a quad bike comes racing down the road driven by a large heavy-set man in a snow-white silk tunic. Read more: Is this the end for Zuma’s presidency? 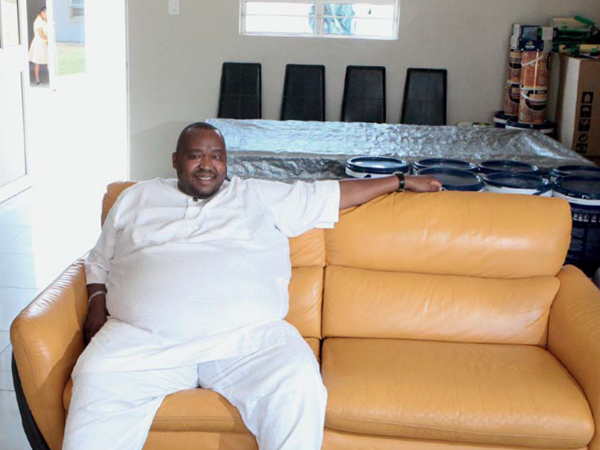 He’s instantly recognisable as Khulubuse Zuma, the president’s notorious nephew who’s often in the news because of his business transactions and flashy lifestyle. He stops where we’re parked. On his left wrist sparkles a Swiss Audemars Piguet watch, costing anything between R50 000 and more than R200 000. He starts questioning us suspiciously. Then he races off again. 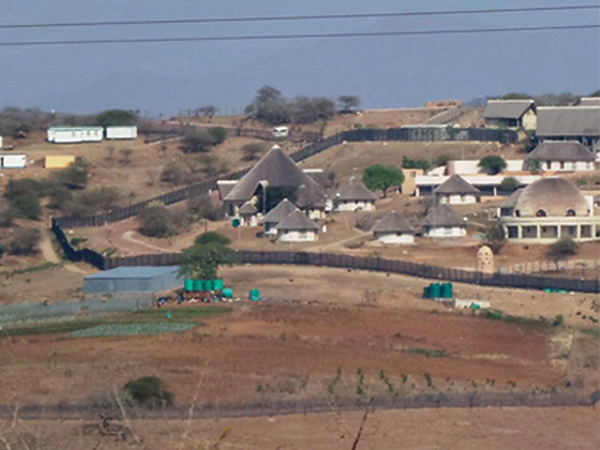 The president’s Nkandla complex, around which his nephew Khulubuse Zuma zips about on his quad bike. TURNS out MaKhumalo’s expensive tuck shop is just a smallish room with shelving on one wall. There’s a fridge in one corner. Not a counter or cash register in sight. MaKhumalo, who married Jacob Zuma in 1973, isn’t here at the moment; her niece, Lungile, is working today. Lungile sits on a white plastic chair with a book and pen in her lap. At her feet is a dogeared English/Zulu dictionary. Read more: Zuma had his day in court: now what? Construction here at Nkandla has cost about R246 million to date, public protector Thuli Madonsela found in an independent inquiry into the project. The policeman looks in at the doorway and angrily talks to Lungile in Zulu. She bows her head and refuses to say anything more. The small office building to the right of the boom cost about R1,2 million to build, according to Madonsela’s report – the price of a house in an affluent suburb. It consists of two rooms and a toilet with a faulty flush handle and a missing lid. Some of the wall tiles have been chipped out. The view from Khulubuse Zuma's yard. We don’t drive through the boom. He races up a new road outside the security fence, past the 20 new rondavels built behind the presidential complex at a cost of more than R17 million to house the president’s guards and other members of staff. The land here is hilly, full of valleys and plains. Everywhere, for kilometre after kilometre, you see traditional Zulu kraals: a few nondescript rondavels with a cattle enclosure nearby. President Zuma was born in such a kraal and tended cattle as a boy. The presidential complex used to look similar until six or seven years ago. We turn off onto a narrower paved road and are now on the president’s nephew’s property, surrounded by four, five, six houses – all new and modern. In the middle is a cattle enclosure which hasn’t seen a cow for quite a while, because there’s no sign of droppings. 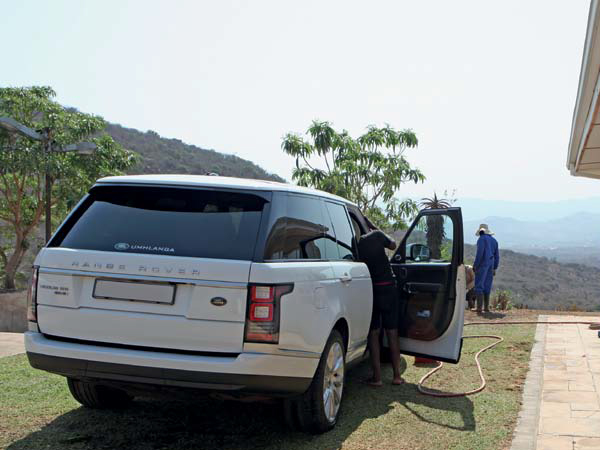 He stops in front of one of the houses, close to a newish Range Rover. Her name is Sibuyle, and she sinks almost to her knees as she greets us. Khulu goes through the back door of one of the houses. In the kitchen stand four large Samsung fridges, brand-new and still in cardboard boxes. On a counter are two Zulu Bibles. He settles on one of three leather couches in the lounge and of his own accord starts talking about his uncle, the president. Khulu relaxes on a leather couch in his lounge. That’s what Khulu calls the president: Baba. Father. “There are two things you need to know about a good Zulu,” he says. “A good Zulu believes in God and believes the ancestors watch what you’re doing all the time. “I pray every day. Every day.” He lifts an arm to show me the broad bracelet around his wrist. It’s made of silver, gold and diamonds. 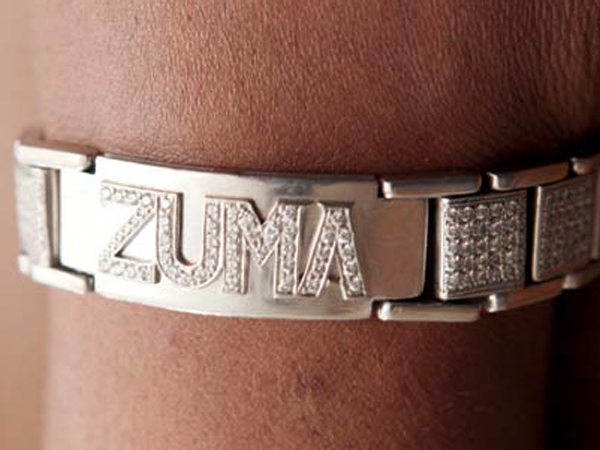 It’s embellished with the name Zuma. He strokes the bracelet. “I designed it myself. It reminds me to pray every day. First I pray to God, then to the ancestors. Khulu designed the bracelet himself. Khulu rubs his cheek, which has a fine scar – the mark of his clan. He was involved in the controversial closing of the Aurora gold mine near Springs in Gauteng, where bankruptcy left hundreds of workers destitute. His cellphone rings and he answers immediately. A young girl enters the room with a basin of lukewarm water and a hand towel. She kneels down so we can both wash our hands because we’re about to eat. The major construction here at Nkandla started in 2009 after President Zuma was inaugurated. “I started advising Baba about the building,” he says. “We’d just started building when the general and ministers arrived and saidwwe’ll have to consider the security of the place. They made all sorts of suggestions with which Baba had nothing to do. To say exactly how many people the Zuma clan consists of is difficult. Khulu counts on his fingers and in his head. Almost all the Zuma men have a lot of children, with more than one woman. “I’d say there are about 170 in our clan.” They meet one another from time to time here at the presidential homestead. Khulu’s cellphone rings again. This time he’s talking to someone who’s on his way to China. 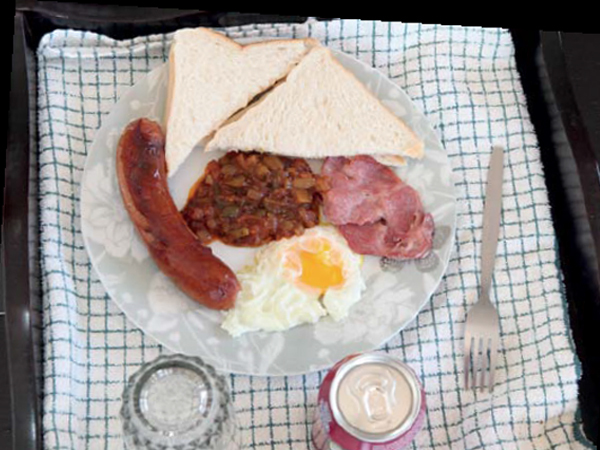 Sibuyle and the young girl arrive with TV trays for each of us bearing a plate of food: a piece of sausage, bacon, eggs, a few slices of bread and a can of Fanta Grape. A snap of our lunch. Khulu lowers his phone and brings the TV tray closer to him. He’s not happy with his sausage. “Gogo!” he calls again. Sibuyle comes to him. He puts the sausage on a side plate and gives it back to her. “Give me a kiss,” he says, then pulls her closer and gives her a glancing kiss on the cheek. Sibuyle looks embarrassed. He prays daily in the traditional worshipping hut. YOU get a good idea of what it must be like to be a Zuma – one of Nkandla’s Zumas – sitting here with Khulu. His phone rings constantly, and it sounds as if everyone wants a favour of some kind from him. A stranger has also just knocked on the door. He has his CV with him and wants to know if Khulu has a job for him. “You have to see how it goes here when Baba is visiting.” Khulu points in the direction of the presidential complex. “The people queue up at the house to see him, hundreds of them. Everyone wants assistance. Khulu suddenly remembers something. He picks up his phone and calls a number. Someone answers. It sounds as if it’s a bank because Khulu asks the person to transfer – and he mentions a very large amount – from one account to another. Just like that. He puts down the phone and once again his voice echoes as he shouts, “Gogo!” She enters and he says something to her in Zulu. The four huge fridges standing here are for the enormous kitchen being built on Khulu’s property. Although he’s paid lobola for four women he’s yet to officially marry any of them. But he plans to marry Swazi princess Fikisiwe Dlamini later this month. “The wedding will be here at my house. Baba will also be here.” He’s silent for a moment. “You know, being a Zuma isn’t always easy. Sibuyle arrives with a tray. On it is a bottle of Johnnie Walker Platinum – 18 years old, single malt. It costs around R1 000 a bottle at a good liquor store. 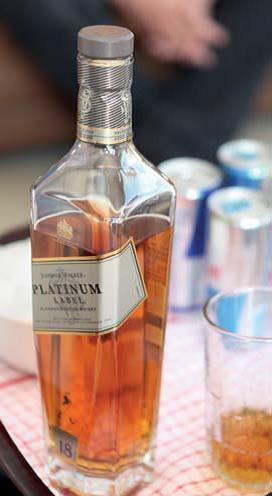 of Johnnie Walker Platinum, which costs about R1 000 a bottle. At one spot there’s a hole in the security fence. MaKhumalo’s tuck shop is closed. 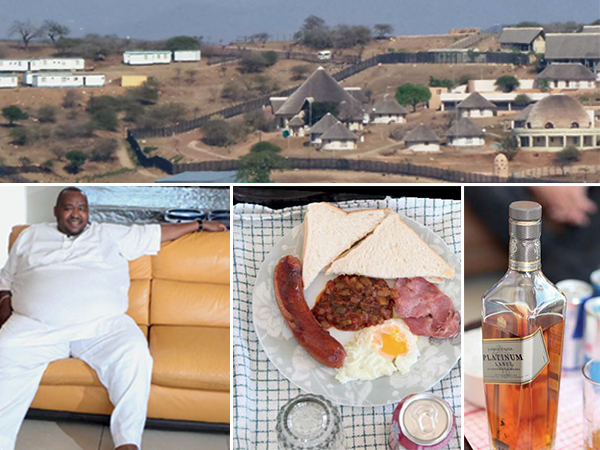 A small herd of goats graze among the thatch-roof houses that cost R17 million. It looks as if the complex was built in a haphazard fashion. Some structures have thatch roofs, others corrugated iron. Some are square and others kidney- shaped. In her report Madonsela says Jean Rindel, the department of public works’ project manager who was involved in the construction project, said it was like completing a puzzle without a picture. At a cost of R246 million. At the high school opposite the presidential compound you learn something else about how the Zumas operate. PK Zondi, a teacher at the school, tells us the president and Khulubuse helped her son, Mthokozisi, to be able to study in Germany. We drive back in the direction of Eshowe, the nearest big town to Nkandla. At the Lindela Tea Room something catches the eye. Parked outside is a quad bike. We pull over. The Lindela Tea Room is actually a shebeen. At first I think my eyes are deceiving me but there Khulu is, standing at a pool table. He’s playing against one of the locals – a guy in a T-shirt full of holes. A few men in ragged clothes are watching. It’s Khulu’s turn to take a shot. The Zuma armband and Audemars Piguet wristwatch shine in the gloomy light. He leans heavily over the table. International entrepreneur. A man with four wives. Nonofficial adviser to the president. 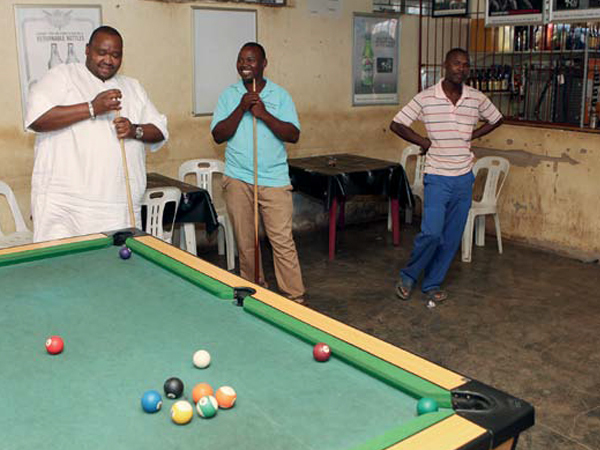 Khulu plays pool in the Lindela Tea Room Shebeen in Eshowe.